The many differences between deck and composite decking. 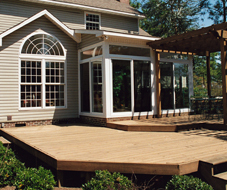 The cost and upkeep associated with each type of decking. The next steps that need to be taken once you decide the type of deck you want. Great Day Improvements can build you deck, whether you decide to use wood or composite decking. If dreams of warm weather find you standing on a new deck, start planning now. Construction completed by qualified professionals shouldn’t take more than a few weeks, but you’ll want a little extra time in advance to conduct research and plan the best outside living space for your budget and needs. 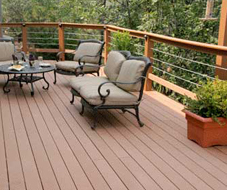 In this article, we’ll look at two types of decks: Composite and Wood. Is one better than the other, and what is the upkeep and cost of each? Composite Versus Wood: Is One Better than the Other? As with most things in life, both wood and composite materials come in low, mid and high end quality. Better grade materials run a bit more in cost but tend to require less maintenance and have a longer lifespan than those on the lower end of the spectrum; this is true for both wood and composite decking materials. To determine which type of deck will work best for your lifestyle and budget, let’s look at the two main components of each: cost and upkeep. Composite decking typically consists of some type of plastic material, such as polyethylene and/or polyvinyl chloride, and wood particles. The plastic may be from recycled products, like milk jugs and soda bottles, or it might be made of virgin plastic. Boards might be hollow or solid. Hollow boards are cheaper than solid boards and don’t tend to expand and contract as often as solid boards do; however, when they do shift, they tend to do so in only one area. Additionally, hollow boards are not as sturdy and can hold water internally, which in turn can lead to warping and decomposition. While solid boards expand and contract more than hollow boards, they are stronger and tend to look more like real wood than hollow composites. Composite decking ranges from $7 or so per square foot to double that and more depending on various factors, like the manufacturer, the materials used to make the decking (recycled, virgin plastic) and ‘extras’, such as UV protection and scratch resistant features. In many cases, a composite deck will cost more than a wood deck at the outset but possibly less than a wood deck over time, thanks to minimal upkeep. So what can you do to minimize the damage? Homeowners with pets and those that plan to use the deck a lot should ask about scratch resistant materials. Decks built in direct sunlight may fade over time; consider materials that include UV protection if you don’t plan to cover the space with some type of patio cover. Composite boards will expand and contract when the temperature fluctuates; to help combat potential damage from this, hire a professional to lay the boards so they don’t move toward the home or other fixtures. Many homeowners considering composite want to know if it can be painted when it fades, and the answer varies. Tom says in many instances no; that what you buy is what you get for the life of the deck. Some companies do sell paints touted to work well on composites. Prior to attempting such a task, I recommend speaking to the manufacturer of the deck you purchased as well as a professional painter. You’ll find numerous horror stories on the Internet from homeowners who, facing a faded composite deck, painted with a product that ended up peeling within a year or so. In terms of cleaning, pressure washing or a soft brush and detergent will rid the surface of most mildew, pollen and things the birds leave behind when they fly overhead. Mildew left for long periods of time might require a deeper cleaning technique, but don’t use bleach: this can fade the deck. Instead, if mold detergent doesn’t do the trick, choose a cleaner made specifically for composites or hire a professional deck cleaner qualified to treat tough stains. The type of wood you choose for your new deck will depend largely on your budget, but a report done by Hanley Wood states a 16 X 20 mid-range wooden deck project in 2011-2012 ran around $10,000. “Your most economical way to go would be treated lumber,” says Tom. “Most of your decks are made of green wood, treated CPA wood; but that’s a more cost effective way of doing the deck.” Southern Pine is one of the most popular options not just at the bargain level but all the way around; this is due to its low cost and high availability. Pine can easily warp, though, and requires more maintenance than some higher end woods. "If using PT wood decking," says Tom, "it's best to use #1 2x6 kiln dried. There is also a wood decking on the market that has reliefs or grooves mortised into the underside of teh decking board. This eliminates warping and cupping." At the mid-price range, cedar, a beautiful wood that gives off an amazing smell, is more resistant to rot but breaks down when exposed to moist conditions. Western Red Cedar is available in most areas, but other varieties may be specific to the region in which you live. Redwood also creates a beautiful deck that can last for several decades, but availability is often limited to the west coast. For a higher grade wood, Edger recommends mahogany or ipe. “(They) are very hard, extremely durable and attractive in appearance.” Plus these two woods have few flaws. “The higher the grade, the better,” he adds. While both ipe and mahogany are heavy woods, neither is prone to splitting or cracking, and they age well with little to no maintenance. The cost of a wood deck will vary according to your location, the type of wood used and size of the deck built. Most wood decks will need to be sealed and stained at some point. Lowes.com recommends this test if you aren’t sure whether or not it’s time to seal your deck: Sprinkle water on the wood; if it absorbs immediately, it’s time to stain, but if it beads up, you can probably wait a bit longer. Tom recommends sealing and staining the wood every three years or so and, in the interim, if the deck becomes dirty or covered in pollen (as ours does several times each year in the south), use a soft bristle brush and mild detergent to clean the wood. Avoid power washing, which can strip the wood. If you prefer to hire someone to do the dirty work for you, find a professional cleaner with experience in cleaning wood decks. 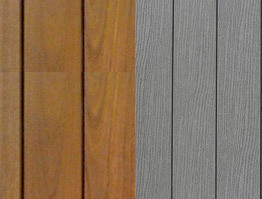 For those who use a stain or preservative on mahogany or ipe, Edger says, “It should be reapplied at least once a year, but the natural color and texture of the wood is beautiful on its own as it develops a striking silver-grey color over time, which is always uniform in appearance.” Choose products that repel water. What’s Next in Building Your Deck? The most important step of the deck building process will be hiring a trustworthy, professional contractor to do the job. “It doesn’t matter if it’s a pond, swimming pool, deck . . . do your homework on the contractor first,” says Tom, who recommends checking the Better Business Bureau before signing a contract. “I believe in selling through education,” he adds, and so should the company you choose. Arm yourself with information about the various types of decks and then interview contractors with experience in deck building to ensure you wind up with an outside space you can enjoy as much as I do. Good luck with the search! Ready to get started? Schedule a free design consultation with one of our decking experts today!